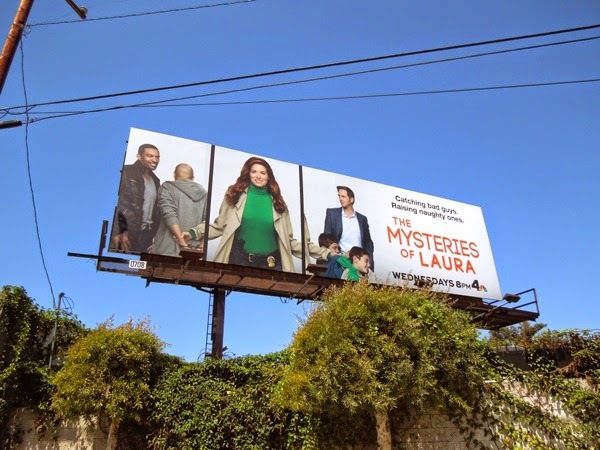 One half of the Will & Grace sitcom equation, Eric McCormack, is currently enjoying success in the third season of his crime drama Perception on TNT, and now it's time for Debra Messing to enjoy her moment in the solo spotlight again courtesy of her new NBC show, The Mysteries of Laura. 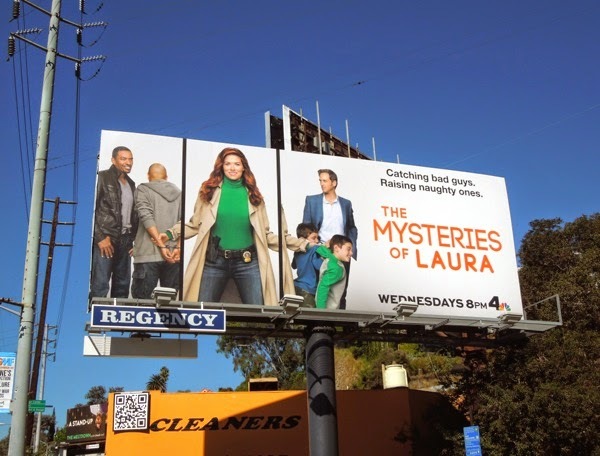 Recently the actress starred in two seasons of NBC's Broadway musical drama Smash and has helmed her own television series in the past with The Starter Wife on the USA Network, which ran for an additional season after an initial mini-series based on the novel of the same name by Gigi Levangie Grazer. 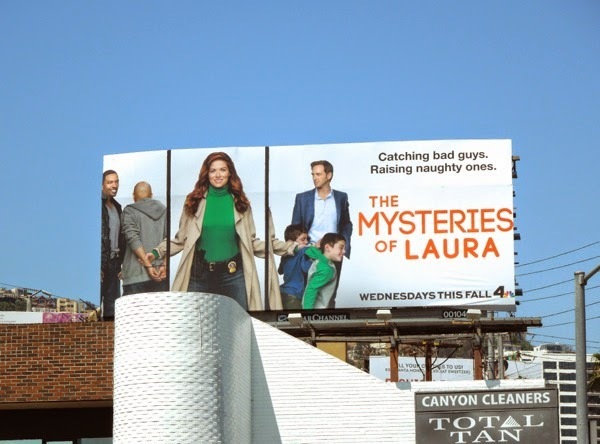 This time the actress (who looks amazing), like her former co-star, also finds herself living in a world of crime as an expert NYPD Homicide Detective juggling her murder-solving day job with her busy family life, she's a single mom to twin boys and has a soon-to-be ex-husband who's also a cop (played by Josh Lucas). 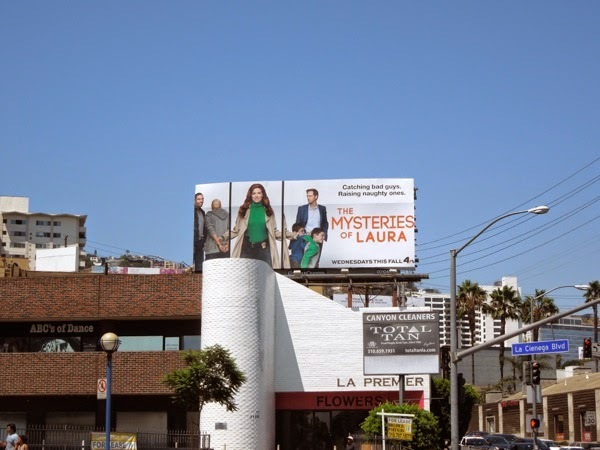 This series premiere billboard (which also features her on-screen detective parter played by Laz Alonso) was snapped above the intersection of La Cienega and Santa Monica Boulevards on July 31, 2014. 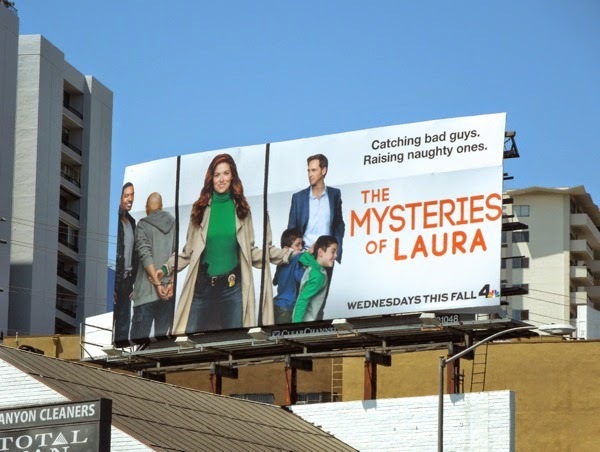 If you're an admirer of Debra Messing, be sure to also take a look at these Smash season one and two billboard campaigns. 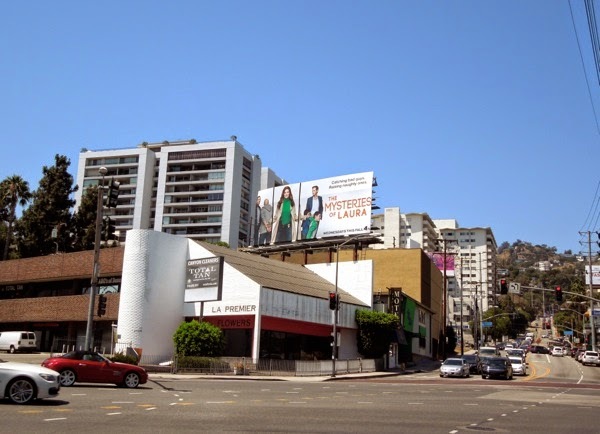 Let's hope this is one Will & Grace alumna that fares better than the wonderful Sean Hayes in his recently cancelled NBC sitcom, Sean Saves the World. 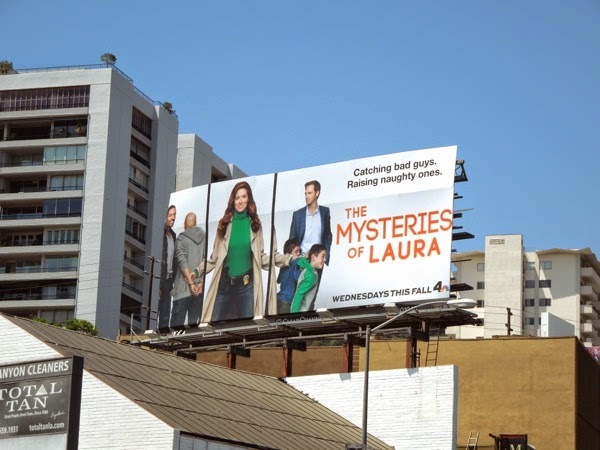 UPDATED: Now that the outdoor promotion for the Fall season is in full swing, here's another two billboards for The Mysteries of Laura snapped along the busy La Cienega Boulevard and Sunset Boulevard on August 26, 2014.